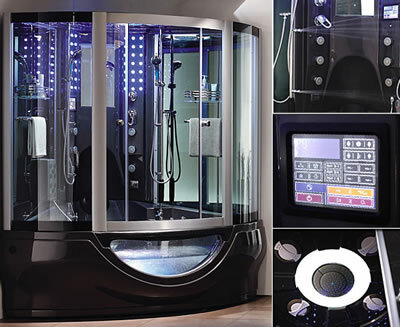 The Aquapeutics luxury steam shower is either the future of shower-based cleanliness, or total overkill. With two handheld showers, steam box and a massive bank of awesome massage jets, it strains to be the bath of the future. Did I say massage jets? Count 'em: 6 acupuncture massage jets, 6 adjustable water jets and 8 smaller water jets, all of which are programmed using touchpad controls. Via Aquapeutics Luxury Steam Shower for bathroom nirvana!.